With other speakers, LtCol. Reymondo Delgado answered questions thrown by the attendees during the open forum segment of the Multi-Sectoral Peace Forum. 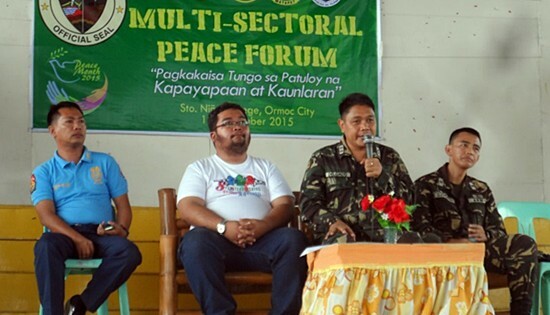 KANANGA, Leyte – Nearly 400 ROTC cadets and students attended the Multi-Sectoral Peace Forum organized by the Philippine Army’s 19th Infantry Battalion in Ormoc City. The forum which was held Saturday, September 19 at the Gymnasium of Sto. Niño College of Ormoc was also graced by competent resource speakers from Ormoc City Government, Ormoc City Police Office and from the Eastern Visayas Regional Development Council. Lieutenant Prolen Bonacua, Civil Military Operations Officer of 19IB said the activity was launched to raise awareness on the significance of sustained peace in the society as the National Peace Consciousness Month is being celebrated this September. “It is imperative that in this generation, people gets clear information on what the government agencies are doing on issues relative to peace and security”, Bonacua said. During the three-hour forum, participants were presented with lectures and audio-visual presentations on the peace initiatives of agencies in attendance. They were likewise given chance to throw questions to the resource speakers during the Open Forum segment of the program. Among those who spoke during the forum was Lt. Col. Reymondo Delgado, Acting Commanding Officer of 19IB who stressed in his lecture two strategic approaches to attain a peaceful society. The said approaches were namely; whole-of-nation approach and the people-centered approach which were stipulated in his presentation entitled: “Bayanihan as Catalyst of a Peaceful Society”. Relatively, Superintendent Ibrahim Jambiran, Chief, Police Community Relations of Ormoc City Police Office focused his discussion on the “Effectiveness of Community Policing and Anti-Illegal Drug Operations”. Ormoc City Mayor Edward Codilla, who has earlier expressed his support in the initiation of the said forum, also presented his assigned topic on “LGUs Role in Keeping the Peace in Ormoc City”. A representative from the Eastern Visayas Regional Development Council, Mr. Leo Christian Lauzon likewise spoke on the topic: “Peace Advocates of the Modern Society”. Delgado maintained that the 19th Infantry Battalion, in support to the Internal Peace and Security Plan “Bayanihan” is firm in its campaign of winning the peace rather than winning the war. “We call on the remnants of the New Peoples Army to peacefully surrender and return to folds of law as taking up arms against the government is no longer significant nowadays”, Delgado concluded. 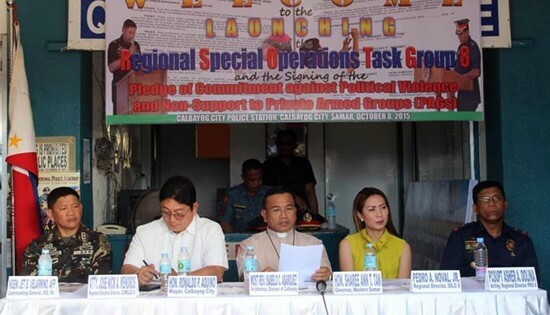 L-R: 8ID chief MGen Jet B. Velarmino, Calbayog City mayor Ronald P. Aquino, Bishop Isabelo C. Abarquez of Calbayog Diocese, Samar governor Sharee Ann Tan-De Los Santos, PRO8 acting director PCSupt Asher A. Dolina during the Signing of Pledge of Commitment Against Political Violence and Non-Support to Private Armed Groups (PAGs) at Calbayog City Police Station on October 8, 2015. CAMP LUKBAN, Catbalogan City – The 8th Infantry (Stormtroppers) Division, Philippine Army, the Police Regional Office 8, Philippine National Police (PNP) launched the Regional Special Operation Task Group 8 and signing of the Pledge of Commitment against Political Violence and Non-Support to Private Armed Groups (PAGs) at Calbayog City Police Station, Calbayog City, Samar on October 8, 2015. The provincial and local executives in the province of Samar signed a pledge of commitment for an Honest, Orderly and Peaceful Elections next year with the religious group, PNP, Philippine Army, election officials, Department of Interior and Local Government (DILG) and media as witnesses. Prior to the signing of the pledge of commitment, a peace dialogue was conducted last month at 8ID Headquarters that aimed at fostering harmony and non-support to political violence among the military, PNP, local officials in the area of Samar and Calbayog City in particular where the shooting incidents transpired, losing 22 lives this year. The RSOTG 8 headed by PSSupt. Isiah Tonog was activated to respond to the security challenges in the province. Serving warrants of arrest to the perpetrators of the shooting incidents in Calbayog City will be their primary task. The activation of RSOTG 8 and signing of pledge of commitment against political violence and non-support to PAGs was attended by Major General Jet B. Velarmino, Commander 8ID; PCSupt. Asher A. Dolina, Regional Director PRO8, PNP; Governor Sharee Ann Tan-Delos Santos of Samar along with her Party; Mayor Ronald Aquino of Calbayog City and his party; Most Rev. Isabelo C. Abarquez, DD, Archbishop of Diocese of Calbayog; field commanders in region 8; the different Municipal Mayors in the province of Samar; Dir. Pedro A. Noval, DILG Regional Director; Atty. Jose Nick A. Mendros, Regional Director, COMELEC 8, and the media. A press conference was conducted after the ceremony to give assurance to the public that the activated task group will function in effect to further iron out security measures, internalize the pledge of commitment and non-support to Private Armed Group (PAGs). Major General Velarmino said the activation of RSOTG 8 will pave way to address lawless activities in Samar. EMERYVILLE, CA – In a world first, Australian Pearl Producers Association (PPA) have entered the Australia pearl oyster fishery to be assessed against the MSC's standard for sustainable fishing. If the fishery achieves certification, this could influence the pearl industry globally and feed the demand for a growing market of people who don't just want to eat sustainable options but want to wear them too. Speaking from the fishery in Broome, Western Australia, Executive Officer of PPA, Aaron Irving is ecstatic at this game-changing move. "People care about sustainability and healthy bountiful oceans and hopefully, if we achieve certification, they'll be able to wear that sustainability with the world's first MSC certified pearls," said Mr. Irving. From the pristine waters of Western Australia and Northern Territory, the pearl fishery which produces pearls, pearl meat and mother of pearl products will be examined over a 12 to 18 month by a team of independent scientists to determine whether it meets MSC standard. MSC Asia Pacific Director, Patrick Caleo, is looking forward to welcoming this unique fishery into the program. "We always think of seafood when we think of fishing but here we have a fishery that will change how we view fishing, sustainability and the different ways we can look after our ocean," said Mr. Caleo. "There's a growing number of people who want to do good by their oceans but also want to look good. If certified, the pearl fishery will allow that discerning customer to not only eat sustainable seafood but also wear jewelry that has positive impacts on our oceans." The fishery turns around AUS$60 - $80 million per year, making it the second most valuable fishery in Western Australia. Independent certification body SCS Global Services will carry out this assessment of the Pearl oyster fishery. Stakeholders are encouraged to provide input throughout the process. To comment on the assessment of this fishery, please contact Dr. Sabine Daume at SCS Global Services: SDaume@scsglobalservices.com. CAMP LUKBAN, Catbalogan City – The 8th Infantry (Stormtroopers) Division, Philippine Army welcomes the 172 new recruits in an Opening Ceremony of the Philippine Army Candidate Soldier Course Class 395 - 2015 at Headquarters, 8th Infantry Division Grandstand on October 2, 2015. Major General Jet B. Velarmino AFP, Commander 8ID graced the opening ceremony as the Guest of Honor and Speaker to motivate the recruits on the true meaning of service. Meanwhile, Lieutenant Colonel Bernaldo Perez Command’s Personnel Officer said that the 172 new candidate soldiers who took their oath are aging from 18 to 26 years of age earning P11, 265 a month, 10 percent of them are college graduate with highest educational attainment on Bachelor of Science in Nursing and Criminology, one of them is registered nurse, 25 percent are college level with highest educational attainment of Bachelor of Industrial Technology and 63 percent of them are high school graduate with TESDA skills needed by the AFP. 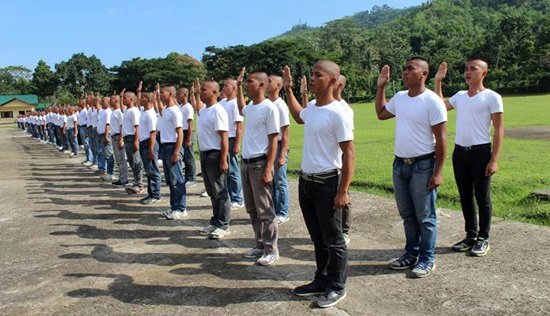 Seven candidate soldiers recruited from Luzon, 28 members from Mindanao and 137 members from Visayas particularly in Northern Samar, Western Samar and Eastern Samar. In a statement made by Major General Velarmino, the new breed of soldiers will be molded and be trained into determined and disciplined soldier that will secure the people of Region 8 against the people who vehemently destroy and violate human’s rights. In the end, the oath taking ceremony gave more hope to the newly candidate soldiers who will bring peaceful environment in Eastern Visayas. QUEZON CITY – Labor group Trade Union Congress of the Philippines-Nagkaisa (TUCP-Nagkaisa) lauded the World Bank (WB) for its new paradigm shift in promoting regular jobs and minimum wage as part of their twin approach in ending extreme poverty by 2030 and in pushing shared prosperity among the poor of developing countries. World Bank President Jim Yong Kim in his speech at the United States Institute of Peace gathering in Washington, D.C., on October 1 the other day, said that a bank study among Latin American countries showed that “enforcement of labor contracts and a minimum wage” is one of the key elements to a genuine inclusive growth. “This study is contrary to and a complete turnaround from previous prescription of the bank that always promote for flexibilization of labor markets. This is now a watershed for working people and we commend the bank for making the right paradigm switch,” said Louie Corral, executive director of TUCP-Nagkaisa and the group’s civil society representative to the World Bank and Asian Development Bank (ADB). Corral contends that flexibilization of labor in the Philippines started after a major amendment in the Labor Code through Republic Act 6715 also known as the “Herrera Law” became effective on March 1989. The amendment spawned new varieties of flexible work arrangements including what is now known as contractual work or “endo” (end of contract), job orders, and “555” (5-month contract) schemes. “We dare the World Bank to implement this new paradigm in their engagement policy with developing countries like the Philippines whose government is abandoning its responsibilities to provide social protection and quality basic services to people,” said Gerard Seno, executive vice president of the country’s largest confederation of unions Associated Labor Unions (ALU). Government’s Labor Force Survey (LFS) released by Philippine Statistics Authority (PSA) in July 2015 showed 38.5 million Filipinos are employed. However, Corral said, half of which are contractuals, mostly in the agriculture and services sector. “Known as contractuals or casuals in private companies and job orders or contracts of services for government employees are work schemes that prevents working people from getting their fair share of our country’s growth. We would like to believe that this bank’s new tack will sooner impact the calculus in the Philippines and tilt the equation in favor of the Filipino working poor,” Seno said. MANILA – Over 30 surgeons, anaesthesiologists and physicians from private and government hospitals are participating in a three-day training course to enhance their capacity to treat patients wounded by weapons or explosives. The training course, which starts today in Davao City, will be conducted jointly by the Philippine Society of Surgery for Trauma (PSST), under the Philippine College of Surgeons, and the International Committee of the Red Cross (ICRC). "The objective is to enhance the capacity of health-care providers to respond more efficiently to the specific medical and surgical needs of people wounded by weapons owing to armed violence," explains Beatriz Karottki, the ICRC's health programme coordinator in the Philippines. "It encompasses pre-hospital care, triage, hospital care and post-operative care, including rehabilitation." Topics dealing with trauma management, such as assessment of injuries, wound care and anaesthesia, will be presented by specialists from the PSST, while the Davao Jubilee Foundation, a non-profit institution providing services to people with disabilities, will talk about amputation, physical rehabilitation and prostheses-fitting. An ICRC surgeon, Dr. Martin Herrmann, will share the ICRC’s experience in war-wound treatment and wound ballistics. As part of its mandate, the ICRC supports the medical treatment of people wounded in armed conflict. In Mindanao, it provides assistance to five key hospitals and conducts various training for medical personnel. With the Philippine Red Cross, it organizes first-aid training for health workers and local government responders in rural health units in Agusan del Sur, Maguindanao and North Cotabato, and for displaced communities in Zamboanga. The ICRC is a neutral, impartial and independent humanitarian organization whose mandate is to protect and assist people affected by armed conflict and other situations of violence. It has had an established presence in the Philippines for over 60 years. (L-R) Lt. Col. Reymondo Delgado, Fr. Edwin Perito, P/SSupt. Franco Simborio, Col. Dinoh Dolina, Mrs. Clotilde Malatbalat, Mayor Eduardo Ong, Board Member Mesias Arevalo, Dir. Artemio Caneja and Ms. Imelda Bonifacio while awarding financial assistance to a former rebel during the Peace Caravan in Brgy. Caghalo, Carigara, Leyte. KANANGA, Leyte – The Leyte Provincial Peace and Order Council have brought basic social services within indigent resident’s grasp, in a Peace Caravan for selected barangays in Carigara, Leyte on Saturday, September 26. Lieutenant Prolen Bonacua, the Civil Military Operations Officer of the 19th Infantry Battalion said its office listed 617 beneficiaries of the various programs and services laid by provincial government, the military, police and other line government agencies and NGOs at Brgy. Caghalo in Carigara town. The beneficiaries came from seven barangays namely: Caghalo, Upper Hiraan, Canlampay, Hiluctugan, Libo, Pangna and Baruguhay Sur who availed of free medical, dental and optical services, medicines, medical consultation for senior citizens, seeds dispersal and deworming shots for livestock, reading glasses, grooming services and at least 500 pairs of slippers. Also part of the activity was the presentation and awarding of basic financial assistance to two (2) former members of the New Peoples Army. Each received check worth P25,000.00 from the Leyte Comprehensive Local Integration Program (CLIP) as reward for their surrender and return to the folds of law. The Peace Caravan likewise includes advocacy dialogue of the primary programs and services of the Department of Interior and Local Government, Department of Social Welfare and Development, Department of Environment and Natural Resources, Department of Agriculture and Department of Health. Peace Caravan according to Col. Dinoh Dolina, commander of the 802nd Infantry Brigade is a convergence of government services with an objective of helping depressed communities such as areas affected by conflicts, particularly by lawless armed groups. In like manner, Ms. Imelda Bonifacio, the Area Manager of the Payapa at Masaganang Pamayanan (PAMANA) in Eastern Visayas described the activity as among the highlights of National Peace Consciousness Month celebrated this September. This years’ National Peace Consciousness Month is celebrated with the theme: “Pagkakaisa Tungo sa Patuloy na Kapayapaan at Kaunlaran”. Police and military personnel from the 802nd Infantry Brigade, 19th Infantry Battalion and 82nd Civil Military Operations Company were also dispatched to assist the Leyte Caravan Team particularly in securing and hauling the beneficiaries en route for and from the caravan’s venue. 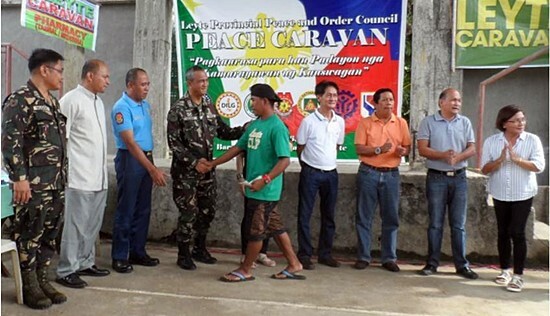 Barangays who benefitted the Peace Caravan were among the communities in Leyte where Bayanihan Team Activities (BTA) of the military are presently being conducted. In a statement, Lt. Col. Reymondo Delgado, Acting Commanding Officer of 19IB said he is hopeful that social issues in villages with Bayanihan Team Activities will be addressed if basic services are effectively delivered. 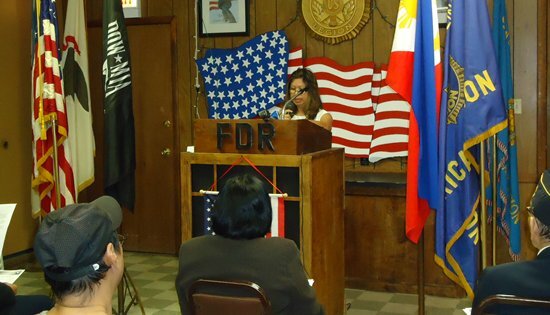 CHICAGO – In a first time event in the US, bells chime at a Memorial led by Filipino WWII veterans along with members from the Fil-Am community assembled at a local American Legion in a Post Everlasting program, remembering the fallen during the Balangiga battle in Samar the morning on September 28, 1901. The names of the forty-eight soldiers killed in action from the roster of US Army Company - 9th Infantry Regiment were read following a strike from a miniature bell. A separate list containing many names of the villagers residing in the surrounding barangays on that day was folded, in hopes that one day the actual 28 names of the towns people killed would also come to be known. Then the pieces of papers with the names were collected, ripped and a match was used to ignite the internal flame. US veterans organizations use this symbolic ritual to commemorate the fallen. The chime echoed a historic memory after each named read. We should not only be impressed, but grateful of a promise kept from our elder WWII vets. The circumstances of that September 28th day is seldom mentioned in our own news media, even representation from the Philippine Consulate Chicago Officers, an extended arm of our Philippine Government designated to work with the Fil-Am community was absent from this historic event. The WWII vets produced a program that not only brings recognition to better foreign policy of our two countries, while showcasing a crucial time in our history never to be forgotten. The healing process must begin somewhere, and from someone and it took our nations heroes of 1942 who knows the ugly face of war. The event accomplished its mission displaying a solemn way of forgiveness from the heart that ended tragically for both Americans and Filipinos on its anniversary, now 114 years ago.